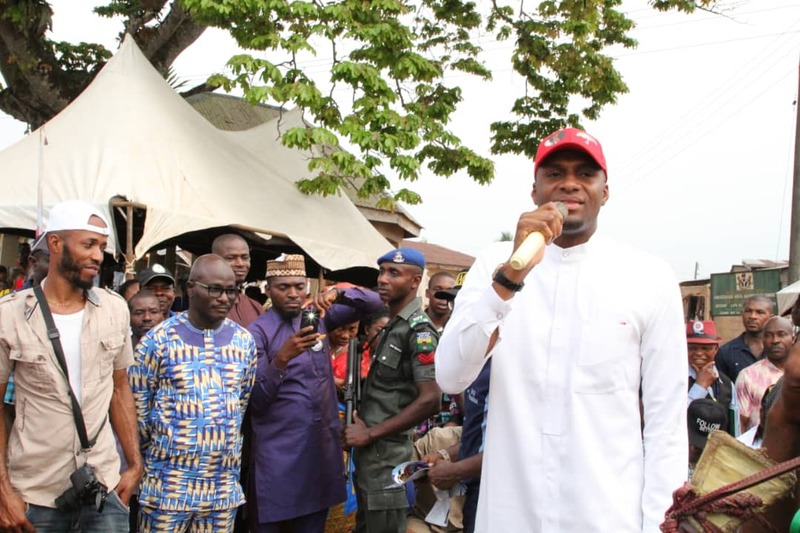 The PDP campaign trail yesterday swept through Uzuakoli and Mkpa in continuation of the party’s ward to ward campaign in Bende. The rally which turned out to be one of the most successful rallies so far, attracted a mammoth crowd of supporters in each of the two communities. The visits also afforded the PDP candidates the opportunity to speak to voters and solicit for their votes and support. The PDP delegation was led by Senator Mao Ohuabunwa, Chief Nworisa LGA Chairman of the Party, Dr. Chimaobi Desmond Anyaso, House representatives candidate of the Party for Bende Federal constituency, Rt Hon. Cosmos Ndukwe House of Assembly Candidate of the party for Bende North State Constituency And Chief Emmanuel Ndubuisi(Ijiriji) for Bende South State Constituency. Starting off their campaign activities with a brief courtesy visit to Eze K.O Ikonte the Ozuo II of Uzuakoli kingdom the team thereafter proceeded to Nkpa and Uzuakoli Wards to hold what was recorded as one of their most successful ward tours since inception of the campaigns. While addressing the different communities respectively, Dr Chimaobi Desmond Anyaso advised that they should not adhere to words from APC as they are all lies and empty promises from stale politicians who have absolutely nothing to offer to the people of Abia North. Dr Chima Anyaso also assured the people of Nkpa and Uzuakoli that if elected on the 16th of February, he will build the same Standard tuition free Nursery and Primary school he built in Igbere and has been running since 2008. After his brief address where he reeled out some of his major achievements in the areas of youth empowerment, education, provision of social amenities and capacity building, a group of decampees from APC and APGA numbering over fifty persons trooped out from the crowd to formalized their move into the ruling Peoples Democratic Party. The leader of the group stated that they decided to join the PDP after careful appraisal of all the other candidates jostling for the House of Representatives seat, they had found Dr Chimaobi Anyaso most suitable for the position. Speaking further, the decampees insisted that if Dr Anyaso could achieve all the great strides attributes to him as a private individual they are confident that he would bring unparalleled development to Bende when he gets to the house and therefore they pledged to support him and the Peoples Democratic Party in the forthcoming elections. You will recall that two days ago while at a campaign rally in Ugwueke, another sixty decampees from the two main opposition parties were also welcomed into the PDP fold showing that the party is well positioned for Victory in the forthcoming elections which is just about three weeks away.